I am unsure how accurate these "real-world" statistics are meant to be, but it seems that Google Chrome is the most used web browser from November 2012 to November 2013. The graph does not take into account the statistics of the recent IE11 upgrade, but nevertheless, Chrome is still ahead of the pack. 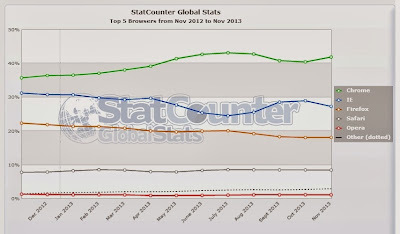 Now in a real world setting, it is safe to assume that Internet Explorer is still the top browser installed on computers. Just take a look at your nearest school or institution. Windows. Check. Internet Explorer as default browser. Yep. As for the average consumer, they probably don't know anything about alternate browsers and what they can offer. 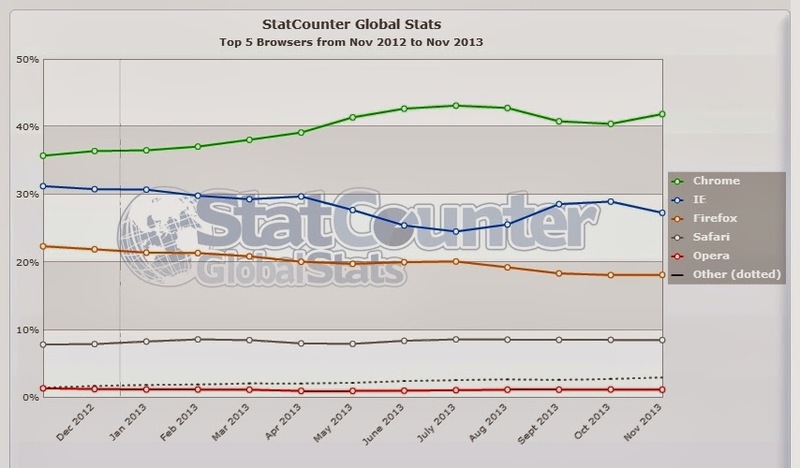 Slowly though, the world of Firefox and Chrome is opening up to the rest of the world. Perhaps one day, we may see the giant IE fall a the hands of Firefox or Chrome.